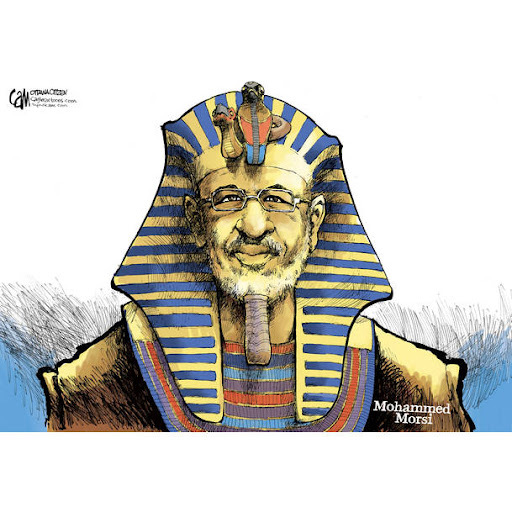 Is Egypt’s Morsi the New Mubarak? I did not vote for President Mohammed Morsi. Before the elections, I appealed to the Egyptians through As-Safir to boycott in protest of Ahmed Shafiq’s nomination for the presidency before the 35 corruption cases against him were investigated. The boycott failed. Millions of Egyptians saw that they had no choice but to vote for Morsi, not because they agreed with his ideas or those of the Muslim Brotherhood, but simply to prevent the restoration of Mubarak’s regime at the hands of Shafiq. So Morsi became president and I said that the will of the people must be respected. I thought it unfair to attack President Morsi before he was given a chance. 1) One of the most important causes of the revolution was the Interior Ministry’s brutal repression. The people demanded that the state security apparatuses be eliminated, that the Interior Ministry be cleansed of Mubarak’s corrupt men and that those responsible for torture be held accountable. However, the Supreme Council of the Armed Forces (SCAF) refused to make any changes to the Interior Ministry during the transitional period. Then, after Morsi became president, we were surprised that he too refused to cleanse the Interior Ministry. Instead, he made use of the old leadership, such as Interior Minister Ahmed Gamal al-Din. It seemed as though a bargain had been struck between the Brotherhood and the Interior Ministry’s men whereby the latter would retain their posts and privileges and remain exempt from accountability for their crimes in exchange for them restoring security and protecting the interests of the Muslim Brotherhood. Security was somewhat restored but acts of repression have also come back. Egyptians are again being humiliated in police stations. Last week, an engineer named Mohammad Fahim was driving in Mansoura. A police officer stopped him and asked for his driver’s license. Mohammad noticed that he had forgotten it at home so he politely asked the officer to permit him to go home with a police officer to get the license. When Mohammad objected to this slight, the officer beat him, had his men lay Mohammad on the ground for a while, then took him to the police station, where they tortured him, fabricated a charge against him and transferred him to the prosecution. He was then remanded in custody pending further investigation. There have been many similar incidents, which indicates that President Morsi — like President Mubarak — doesn’t mind that citizens are being tortured and are having their dignity violated. In fact, the dignity of the Egyptians abroad is not better than the ones at home. It is well known that the Saudi legal system does not conform to international standards of justice. But even though the Saudi legal system does not touch foreigners, hundreds of Egyptians are held in Saudi prisons either without trial or as a result of unfair trials. Among them is Ms. Najla Wafa, who is being flogged every week because she had a fallout with one of the many princesses from the Saudi royal family. There is also the case of Ahmed al-Gizawy. This lawyer is being tried on trumped-up charges because he dared to speak about human rights violations against Egyptians in Saudi Arabia. During President Morsi’s first visit there, he exchanged hugs and had his picture taken with Saudi officials. Yet he did nothing to help his citizens who are detained in Saudi Arabia. Moreover, in Egyptian military prison there are thousands who have been detained during protests on false charges. The 8 April officers were arrested for taking part in a demonstration on 8 April 2011, to protest an attack on a sit-in. There also the “April 8 officers” who joined the demonstrations in Tahrir Square. They were arrested and subjected to severe torture. They are still locked up. Before he was elected, President Morsi promised to release them as soon as he took office, but so far he has not done so. 2) When President Morsi formed the government, we were surprised to see that it included several ministers from the former regime. This indicates that Mubarak and Morsi’s policies are not very different. President Mubarak was partial toward the rich, whom he tried to please and help increase their wealth, while he didn’t care about the poor’s suffering. Morsi is unfortunately no different than Mubarak in that regard. 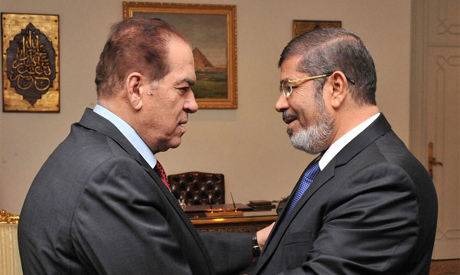 Morsi is now close to the businessmen who belonged to Mubarak’s regime. When he visits foreign countries, he takes them with him aboard his plane. As he tries to deal with the economic crisis, Morsi is not considering cutting state spending nor laying off advisers who are unduly being paid millions. He is not considering imposing a progressive tax on the rich nor stopping gas and electricity subsidies to factories that sell their goods at international rates. President Morsi is not considering making such moves because they threaten the interests of the rich. He borrows like Mubarak: he requested $4.8 billion from the International Monetary Fund (IMF) without revealing the loan’s terms to the public. We should mention that former Prime Minister Kamal Ganzouri also wanted to borrow from the IMF but at the time the Brotherhood strongly objected, saying that borrowing would increase Egypt’s debt and that paying interest is against Islamic law. But now, here they are cheering president Morsi’s loan request, which they suddenly discovered to be in conformity with Islamic law because “it is a necessity,” and the ends justify the means. It seems the Brotherhood has multiple doctrines from which it picks and chooses whatever suits its interests. 3) The Mubarak regime used to control the media and the national newspapers, which it utilized to spread lies and depict Mubarak as an inspiring and wise leader. Rather than make the newspapers independent and eliminate the Information Ministry, President Morsi appointed a Brotherhood member as Information Minister and the Brotherhood-dominated Shura Council appointed atop the national newspapers new editors who are well aware that they owe their positions to the Muslim Brotherhood. The Brotherhood’s influence over the media is becoming clearer by the day. As it did with Mubarak, state television keeps broadcasting images of President Morsi. The president sits majestically and full of confidence, and in front of him sits a TV announcer who is shuddering with fear because he knows that one wrong word could end his career or even his life. President Morsi has maintained Mubarak’s corrupt media, which he is now using to his advantage. 4) The Constituent Assembly is now controlled by the Muslim Brotherhood. This means that no matter how many hearings and discussions they hold, the Brotherhood’s “supreme guide” will have the final say in determining Egypt’s constitution. Before he was elected, Morsi promised to make the Constituent Assembly representative of all parts of society. But as usual, he broke that promise and kept the assembly unchanged. The assembly is writing unacceptable articles that limit public freedoms, women’s rights and the freedom of the press. It is likely that the assembly will write a constitution that serves the interests of the Brotherhood and then call for a quick referendum whereby the Brotherhood’s mighty political machine in the mosques would convince the ordinary people that they must approve the constitution to ensure their entry into heaven. 5) President Morsi promised that public freedoms would flourish under his reign. But the opposite has happened. Newspapers were seized and al-Faraeen channel was closed. Regardless of how we felt about that channel, we do not accept that it be closed by an administrative order because then any channel that Morsi does not like can also be closed. Islam Afifi is accused of insulting Prophet Mohammed . Brotherhood official Mahmoud Ghozlan said that journalists will not be exempt from imprisonment because they are not better than others. This statement betrays Ghozlan’s ignorance on what happens in civilized countries, where writers and journalists are not imprisoned because of their opinions or writings but are punished by paying a fine, if convicted. Freedoms may not be better under Morsi than under Mubarak. In fact, they could get worse. 6) President Morsi was elected by the people but he also belongs to the Muslim Brotherhood, which is a secret organization and no one knows its rules, regulations or funding sources. We have repeatedly demanded that the Brotherhood’s status be codified and that its funding sources be placed under state supervision. But it seems that President Morsi prefers to keep the Brotherhood a secret group that supports him from behind the scenes. The president’s connection with the group has resulted in behavior unacceptable in any democracy. Brotherhood official Khairat Shater behaves as if he were the prime minister. He makes statements on government projects. He travels abroad and meets with foreign officials with which he negotiates and signs agreements. But under what capacity is he doing that? We really don’t know who rules Egypt: President Morsi or the Brotherhood’s supreme guide? The situation has become worrisome. It seems that after the revolution nothing changed except the president. 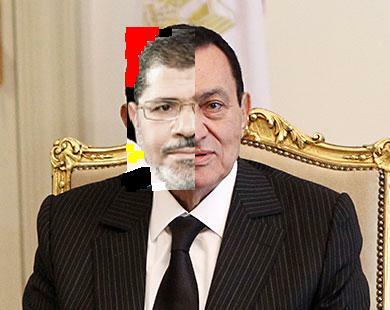 Mubarak was simply replaced with Morsi. President Morsi moves around guarded by 3000 troops. When he prays at the mosque he prevents police officers from entering the mosque in order to keep the president secure. When Morsi traveled to Rome he stayed at the same luxury hotel where Mubarak used to stay, costing the state thousands of pounds per night. The revolution made a great achievement when it deposed Mubarak, tried him and threw him in prison with his followers. The revolution’s task now should be to prevent the Muslim Brotherhood from controlling the state. If the national forces do not immediately unite to prevent the Muslim Brotherhood from fully controlling the state then we and our children will pay a high price. The people who made this great revolution are capable of protecting it, God willing.